Argan Oil, often referred to as 'liquid gold' has been the secret to great hair for many generations. By using Satliva Hemp with Argan Shampoo Bar, you can skip all chemical conditioners. Argan oil helps mend split ends and tame frizzy hair. It is non-greasy, prevents damage from heat and keeps hair shiny. Rosemary essential oil soothes scalp irritations, while the invigorating tea tree essential oil leaves hair clean, shiny and refreshed. 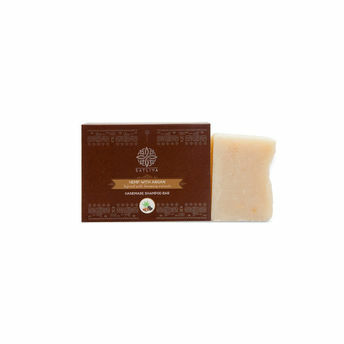 You need to give the shampoo bars some time to rid your hair of the old residues from your commercial shampoo. As shampoo bar soaps do not strip hair in the same way as detergent based shampoos, you may notice that wet hair feels different after washing than what you may be accustomed to. This is perfectly normal; you'll love how your hair feels after it dries.